Picking the right vendors for your business is critical. There are many factors to consider and take into account. Some of the key criteria I have seen dealers evaluate are obvious, including retail price point, margin, product assortment, tech support, ease of install…even shipping policies and speed of shipping. There is one critical metric I have not really heard many dealers talk about, but one I would be hard pressed to live without — innovation and product development. This can come in several forms, but the two most common are breakthrough new products and technologies and improving upon and perfecting product that is already in the marketplace. There are two companies I work with that exemplify each of these traits. Screen Innovations (SI) says it right in their name — they are incredibly innovative. The Black Diamond screen material was a game changer for our business. As I mention frequently, we do a lot of business in NYC. Front projection is not for home theaters in this market, it is for multi-purpose rooms where there is often a lot of ambient light. Black Diamond solves a lot of problems in bright apartments with huge windows that are high up on the 30 or 40 floor. Slate has been a game changer as well, with the motorization to make the screen disappear and appeal to spouses and interior designers alike. And with the Solo Pro screens, we can bring an easy installation with a very low-profile casing that disappears behind a small fascia or even blends in with the shading fascia, so it works just mounted on the wall. In NYC high-rises, we typically do not have much room in the ceilings — maybe 4-6 inches, so flush-mount screens are not an option. With the Solo Pro and some creativity, we can give the client the look they want, with a great performing screen and the huge presence that is the hallmark of front projection. Without our SI partnership, we would not do nearly as much front projection as we have done in the past. 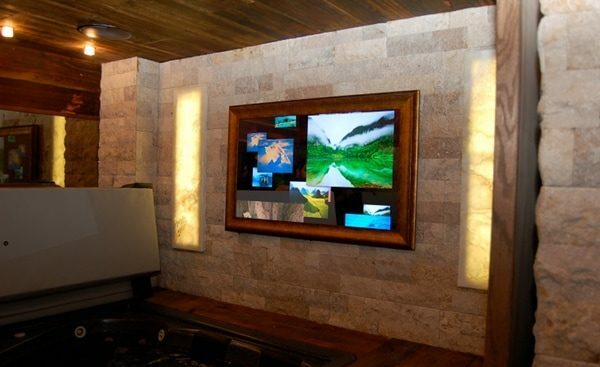 Crestron excels at improving something that is already in the market. The best examples are in video distribution. HDMI matrices have existed virtually since HDMI was released, and they usually worked OK. Some of the big technical issues were slow switching and handshake/EDID concerns. Clients also balked at buying an 8×8 matrix when they only had four TVs. Crestron introduced Digital Media (DM for short), which revolutionized HDMI distribution for me. Switching is lightning fast, there are no handshake issues, and DM can even manage CEC so that it will control source devices such as AppleTV without an extra wire, but will prevent CEC from unintentionally turning on other devices. Additionally, with a chassis structure, clients only needed to buy as many input and output cards as needed, and those cards could be updated and swapped as needs changed for things like 4K, audio extraction, and HDBaseT. Then Video over IP came and there were some clear leaders. I was not an early adopter of the technology since the modular nature of DM made it less critical to manage the number of inputs and outputs. Crestron introduced NVX and, again, they have raised the bar with a solution that just works, every time, and is easy to deploy. They took what was out there and made it better. Be sure to support the companies that innovate in our industry. We need them to keep raising the bar and allowing us to offer our clients new, creative solutions that are highly reliable and integrate well with other products. What are some great innovations you’ve seen that have been game changers for you and your business? The Source Home Theater has delighted hundreds of clients with electronic solutions that meets their family’s needs. We offer state-of-the-art systems that are reliable and professionally integrated with the architecture and décor of your home.